1 of 4 In a small bowl, whisk together mayonnaise, lime juice, brown sugar and chile powder. Refrigerate. 2 of 4 Heat oven to 450 degrees . Place 2 racks on each of 2 baking sheets. Place tortillas on racks and lightly spritz both sides with nonstick cooking spray. Bake at 450 degrees for 5 to 7 minutes or until crisp. Remove tortillas from oven and reserve. 3 of 4 Heat broiler. Coat broiler pan with nonstick cooking spray. Season shrimp with salt and pepper and place on broiler pan. Broil for 2 minutes per side or until cooked through. Remove shrimp to a plate. 4 of 4 Spread top of each tortilla with about 1 tbsp of mayonnaise mixture. 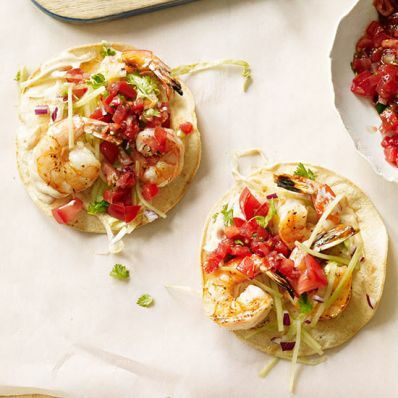 Top with equal amounts shrimp, lettuce, tomatoes, onion, cucumber and cilantro. Squeeze a wedge of lime over each. Serve with salsa and, if desired, sour cream on the side.